Stouts and St. Patrick's Day go together like movies and popcorn! There’s something about St. Patrick’s Day that makes you want to reach for the nearest stout. Mid-March weather is notoriously soul-crushing — both in South Jersey and in Ireland — so it makes sense to want to quaff something as dark as the sky. That’s why we’re pleased to tap Cape May Stout this week, just in time for St. Pat to drive the snakes out of Ireland and drive the stout into your glass. The Stout Is Coming Out! It will be here on December 11. 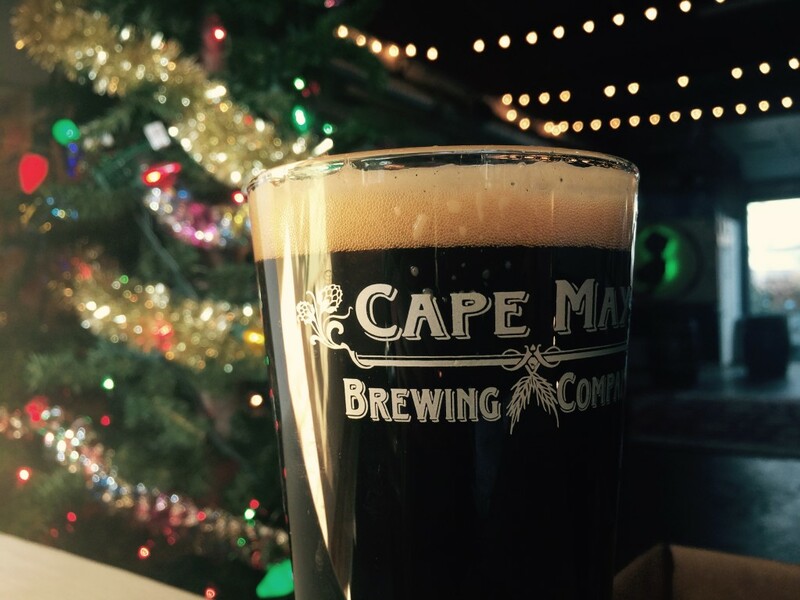 We’re talking about our dark, sweet, roasty, toasty Cape May Stout. Think chocolate-covered coffee beans meets subtle toffee goodness — a lot of punch packed into an easy-drinking, 5% beer. We mash this at a temperature two degrees higher than is typical for a full-bodied brew, so there are plenty of sugars left behind, creating a pillowy head for your drinking pleasure. If you’ve finished your holiday shopping at our pop-up shop — or even if you’ve considered maybe, possibly, sometime soon starting your holiday shopping — reward yourself with this sweet stout. Few things are certain. Among them: Death. Taxes. And pumpkin-flavored brews taking over liquor store shelves come October. But how long does the pumpkin madness last? According to a new report from the Brewers Association, not as long as you might think. 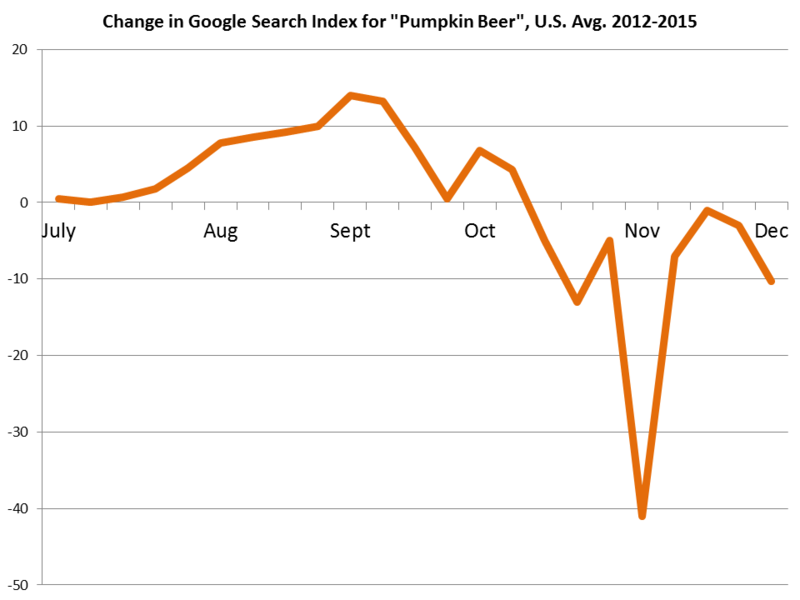 In fact, says the BA’s Chief Economist Bart Watson, “November 1 marks a sharp shift in beer lover interest.” Pumpkin beers fall out of favor, experiencing a drop in popularity second only to the fall from grace experienced by Christmas-themed beers after December 25. But between gourd-graced labels and bottles rife with reindeer, what is there? In other words, who’s the hero of November beer? 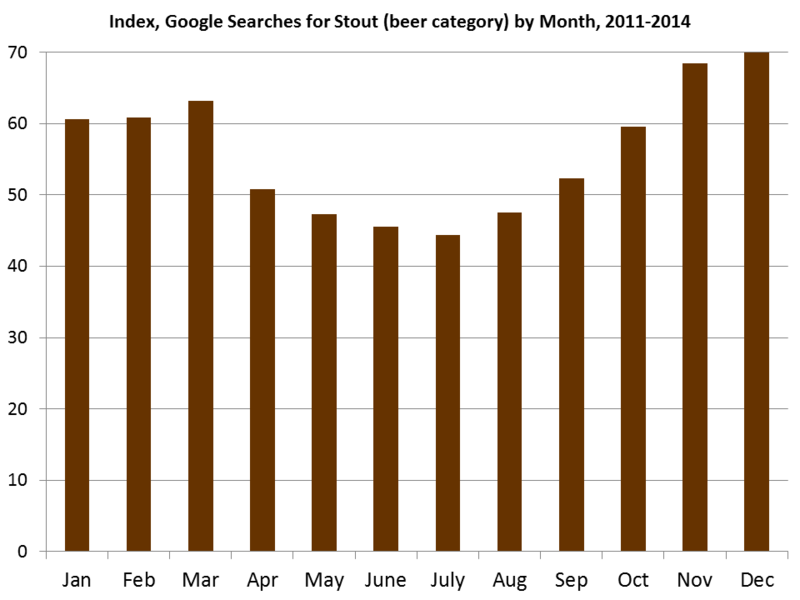 Based on a cross-section of data, including your Google searches, the answer is… many different brews. We’re talking Scottish ales, amber lagers, specialty releases and more. But one category that stands out among the crowd is — drum roll, please — stout. Well good news, gang… we’re on trend! Our Cape May Stout is coming back on tap in the not-so-distant future (watch this space). An “even-keeled” beer, according to Chief Operating Officer Chris “Hank” Henke, the brew is similar to a ‘session stout’ — low in alcohol, high in roasty-toasty goodness.